Published by Mountainblog on 01/08/2018 . All that stuff about getting older is quite a thing. For many girls, it cannot happen soon enough. With the new winter boot models EMMA GTX® HI and LARA GTX® MID, girls can easily be in mum’s league when it comes to style. This winter will turn into a fashion runway, because with these two trendsetters the little snow princesses will have their grand entrance. That’s what you get with the stylishly chic look that makes everything else look childish. Embroidered detail, subtle colours, and a top-stitched collar turn these two winter boots into total trendsetters. 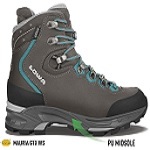 The EMMA GTX® HI with its side zipper for easy-on, easy-off showcases as completely lady-like, whilst the LARA GTX® MID with its elastic lacing and single hook-and-loop strap comes off a bit more delicate. Inside, both winter boots are lined with soft fleecy GORE-TEX® Partelana, which offers reliable protection from wind and weather on wet and cold days. 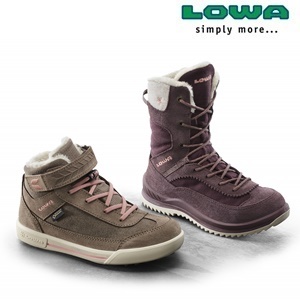 With the EMMA GTX® HI and LARA GTX® MID winter boots, let the winter begin! These fashionable boots guarantee bright shiny eyes in girls both in the transitions between seasons and in crisp temperatures.